Investigate the disappearance of pilgrims around Molag Mar. Molag Mar — Investigate the pilgrim disappearances around Molag Mar. Investigate the Ashlander camp at Almurbalarammi. Talk to Ibaal at the Helan Ancestral Tomb. Lead Ibaal to the glass mine. Talk to Captain Naros at the mine entrance. (Optional) Rescue any survivors in the mine. I should find Captain Naros at the canton and offer my assistance. 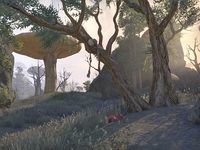 Captain Naros suspects a nearby Ashlander camp is behind the attacks and asked me to search their camp for evidence of their guilt. Captain Naros cautioned me against killing Ashlanders until we have hard evidence they are behind the attacks on pilgrims. I discovered evidence that the Ashlanders are making blood sacrifices, but found nothing conclusive. I should investigate their sacrifice site for any sign of the missing pilgrims. An Ashlander caught me searching the ritual site. He hasn't attacked, so he might cooperate. I should speak to him. Ibaal claims that Ashlanders have not been attacking pilgrims and said that some of his own people have also disappeared. We agreed to cooperate and he gave me the locations of pilgrim camps that he found ransacked. What I saw at the campsites adds credence to Ibaal's claim that the Ashlanders aren't responsible. The pilgrims looked like they were devoured by some sort of monster. Ibaal claims he's heard strange sounds coming from an ancestor tomb near the camps. He suspects something inside may be responsible for the recent deaths, but won't disturb the tomb. I'll have to investigate myself. The sounds coming from the ancestor tomb turned out to be a pilgrim in hiding. He might be able to tell me who has been attacking others like him. I discovered a pilgrim hiding in the ancestor tomb Ibaal lead me to. He claims to have survived an attack by the Ruddy Man, a monster of myth. There is no sign of the creature, so I should lead him to safety. The survivor I found is safe for now. Ibaal will want to know what I learned about the attacks from him. Ibaal doesn't believe that our culprit is the Ruddy Man, but suggests the tracks might lead us to where our quarry lives. We followed the tracks to a cliff face near the glass mine and the monster has appeared. I should be ready if it attacks. We spotted the monster on the cliffs near the glass mine. It was watching us, but fled when it was detected. I should speak with Ibaal about what we saw. I found evidence that the monster, possibly the Ruddy Man, has attacked both pilgrims and Ashlanders on the road by Molag Mar. I should bring my findings to Captain Naros. She mentioned heading to the glass mine, so I should look for her there. Captain Neros refuses to believe that the monster I discovered is the Ruddy Man, but has agreed to allow me to enter the mine to hunt it and Ibaal has returned from speaking to the Ashlander Wise-women. I should see what he learned. Ibaal gave me a potion to shatter in the supposed Ruddy Man's lair that should bring the creature out of hiding. First, I must find its den within the glass mine. Captain Neros [sic] mentioned people were still unaccounted for. I should be on the lookout for survivors who may need my help while I hunt for the Ruddy Man. I found the monster's lair, but it hasn't revealed itself. Ibaal claimed the potion he gave me would drive the creature out of hiding. I should smash it to force the Ruddy Broodmother into the open. The monster was ferocious, but I prevailed. It will not harm anyone again. I should let Captain Naros know the true threat has been dealt with. Captain Naros has accepted that the monster in the mine was the culprit, exonerating the Ashlanders. I should let Ibaal know that our plan worked. Finishes quest Ibaal said he and his kind would be leaving soon. I should say my goodbyes before he returns to the Ashlands.